It is no news, startups are springing up in Nigeria faster than we can say “Jack Robinson”. The entreprenual power, wealth and opportunities in Nigeria are so enormous, the sky is big enough for everyone to fly and that’s why international companies are breaking legs just to get a foot in. 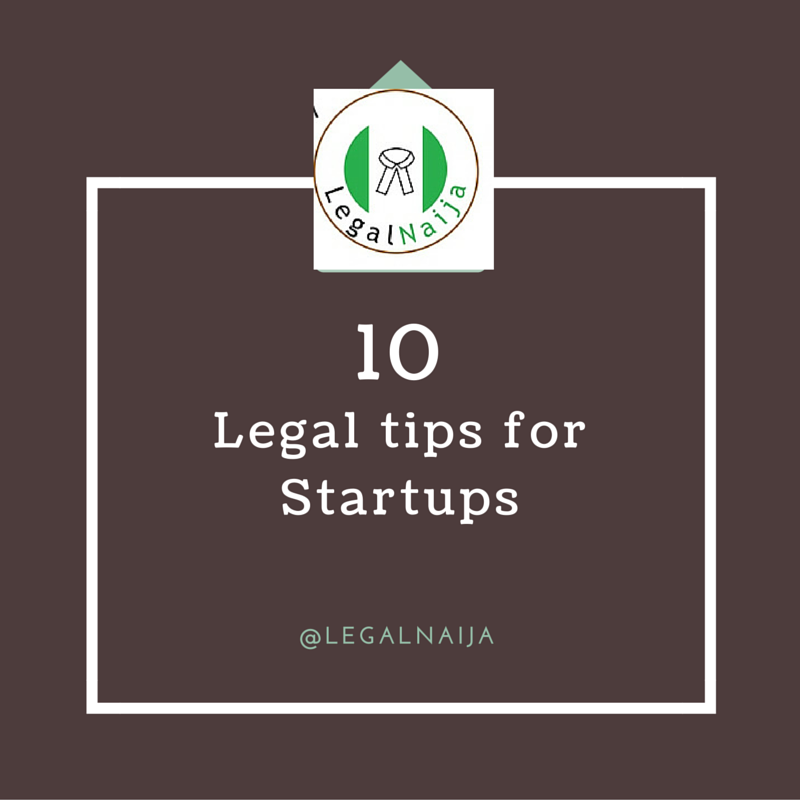 Having a startup goes well beyond having an idea, implementing and executing your business plans and strategies with adequate legal and commercial advice is another step in making your business a success. 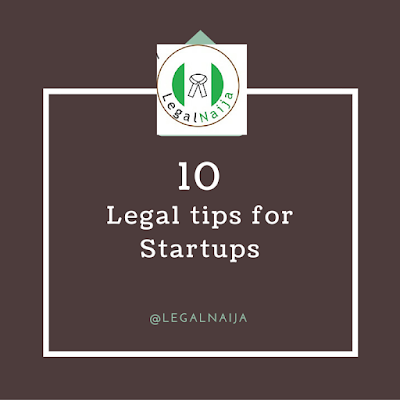 I suggest you pay attention to the following legal tips as it may be what makes or breaks your business. You have a great business idea and you have picked the perfect brand name for your enterprise. It is advisable that you register that business name or at least find out if it is available for registration at the Corporate Affairs Commission before you roll out your campaign. I have a friend who had picked a wonderful name for his business and had gone out to print material and represent himself to local and international clients with the name. He was really upset when informed after conducting a search at CAC that the name he chose was not available for registration because the name had been pre-registered. He had to spend so much money changing his brand and re-introducing the new brand to clients. Therefore, register your business and secure your brand name as soon as you can. Many startups when allocating shares in their companies sometimes do not provide for investment shares which can be sold to would be investors. Also, some make the mistake of having an inadequate share capital for the type of business they are into. For instance, registering a company with 1 million Naira share capital is fine if your business catering, however, if you want to start a sport’s betting company or a tech firm that intends to build phones and other gadgets, your share capital should be about 30 million. After registering your company, there are a number of post-incorporation obligations which your company must observe. For instance, filing your tax returns and notifying CAC of any change in your status. This is why The Companies and Allied Matters Act mandates every company registered in Nigeria to have a company secretary who is usually a legal practitioner. Your industry may be regulated by government agencies and policies. For instance, if your business is the making of food and beverages or medicine, it is mandatory that you obtain a NAFDAC registration number for each product. Also, your business model may involve certain transfer of technology between countries, in such situation you will be required to get a license from the National Office for Technology Acquisition and Promotion (NOTAP). It is important that you identify the relevant government agencies involved in your sector and ensure strict compliance with all policies. Doing otherwise may result in sanctions which may affect your business badly. The consequences for not having your legal house in order can be expensive. Documentation is essential. Taking the time to get your paperwork in order ahead of time pays off big as your company grows, so make sure that you get all of your initial legal work correctly pulled together and carefully maintained. This includes offer letters, confidentiality agreements, option agreements and, most importantly, your initial customer contracts. It is usually prudent to have an off-site storage for copies of all your files. In case of loss, this will help you retain all valuable piece of documentation. Ensure your register your patents and trademarks before going into business. Don't get two years into your business and then find that you have to change the name of a popular product or even your entire company because someone has just realized that you're using a variant of their name and wants to sue you. This is similar to ensuring your company name is registered. Retaining the services of a good and trustworthy lawyer is as important as every other tip for startups. Your lawyer could be the saving grace that prevents you from making a really bad company decision. It is also important to educate yourself on legal issues in your industry. Legal fees could end up being a large upfront investment when you start your business but the advantages are immense. Draft your workplace policies and procedures to protect your business. In order to protect yourself, ensure that your polices restrict employee abuse (accessing restricted websites or sharing confidential information). Adedunmade is the Managing Partner of Adedunmade Onibokun & Co., a corporate commercial law firm located in Lagos, Nigeria.